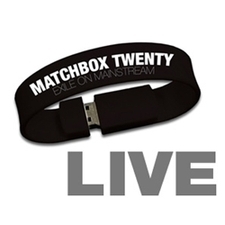 The MATCHBOX TWENTY Exile In America concerts will be recorded live each night and loaded to the MATCHBOX TWENTY wristband that plugs into any USB port. Listen to the live show on your computer, share it with friends, burn it to a CD, or upload it to your iPod or any mp3 compatible device! Mac and PC compatible. This unique MATCHBOX TWENTY USB Wristband has been featured on the Today Show, USA Today and Billboard Magazine! Re-live the audio experience of the concert you attend or get your hands on a concert that you missed!